June 6, 2011 - The future of Jetpack travel is a step closer after the latest record‐breaking test in the Martin Jetpack. The Jetpack shot into the sky over the Canterbury Plains, New Zealand at a climb rate of 800ft per minute, reaching an altitude of 5,000 feet before safely deploying the first ballistic jetpack parachute. The flight duration under its own power was 7:15 minutes. The previous record was 100 ftp minute and 50 feet altitude. This incredible flight high above Pudding Hill in Canterbury is a major step towards commercial production of the world?s first practical Jetpack being developed by New Zealand?s Martin Aircraft Company. ?This successful test brings the future another step closer,? said the Jetpack?s Inventor, Glenn Martin. The record‐breaking flight is part of an intensive period of flight‐testing for the Jetpack as the Martin Aircraft Company works through the final development phase of the Jetpack?s technologies with the aim to have first deliveries of both the manned and unmanned (UAV) versions to key customers within the next 18 months. Named one of Time Magazines? top 50 inventions for 2010, the Martin Jetpack has the ability to fly for half an hour or more, climb more than 1000ft per minute and to cruise at 100 km/h. 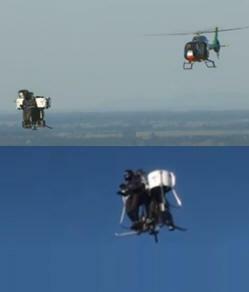 ?In this test we limited the jetpack to 800 ft/min climb so the chase helicopters could keep up,? said Martin. Another first during the high flight was the world first test of the Jetpack?s Ballistic Parachute safety system. While this test was a verification of the safety system using an off the shelf version; Martin Aircraft believes that with the purpose built Ballistic Parachute they are developing, unlike helicopters, the Jetpack?s avoidance curve can be removed entirely ? meaning that with the Martin safety systems there is no height where a catastrophic failure needs to lead to significant injury. For this high altitude flight the company tested the UAV unmanned version using a weighted dummy simulating a pilot?s weight to demonstrate the Jetpack?s ability to fly high. ?This test also validated our flight model, proved thrust to weight ratio and proved our ability to fly a Jetpack as an unmanned aerial vehicle, which will be key to some of the Jetpack?s future emergency/search & rescue and military applications,? said Martin. The earliest Martin Jetpack customers are expected to be in the military and emergency response sectors around the world. Unmanned Jetpacks could be used for delivery, observation and extraction in areas and situations too dangerous for people and other aircraft to get to. Martin Aircraft CEO, Richard Lauder said the Christchurch based company is now in an intensive testing period to refine technology in the areas of safety (the Ballistic Parachute), engine performance over extended and continuous hours of operation, and high speed flight stability. He said all the technologies tested during the high flight performed well and technicians are already working on the next test to push new boundaries of the flight envelope. Lauder stated ?this latest successful high flight was a complex aviation event requiring approval from the Civil Aviation Authority, and took several months to coordinate. From a company point of view, the high flight shows Martin Aircraft?s development over the past two years and its expertise in coordinating and running a sophisticated and complex aviation event of this nature. ?In the past two years we?ve gone from unveiling a world leading invention to a company on the verge of international commercialization of both the manned and unmanned versions of the Jetpack.? Since the public unveiling of the Jetpack at Oshkosh in the US (the world?s biggest aviation show), Martin Aircraft has received substantial interest from governments, military and emergency services around the world, along with many in the general aviation sector who are interested in being one of the first to own a jetpack. Based on customer demand and international interest in the development of the Jetpack for a range of uses, the Martin Aircraft Company believes the Jetpack has the potential to become a significant international export earner for New Zealand. The Martin Jetpack is a vertical take‐off and landing aircraft that can either be flown by a person or operated unmanned. In the future when disasters strike the jetpack could be used to fly rescuers to areas where helicopters and planes can't get to. The Jetpack has a number of advantages over helicopters most importantly it?s easy to fly. On average a Jetpack pilot will be trained and competent with only around twenty hours of classroom and flight training, costing just a few thousand dollars. Helicopter pilots, by comparison, take 50 hours of flight time and many more hours of classroom training, costing tens of thousands of dollars. That means, in a rescue service for example, rather than having a single dedicated pilot, every member of a team could be trained and competent in a Jetpack. It?s safe. With the Ballistic Parachute, unlike helicopters, the Jetpack?s avoidance curve can be removed entirely, that is to say with the aircraft?s safety systems there is no height where a catastrophic failure needs to lead to pilot fatality. The operating costs are hugely lower. Compared to helicopters currently used for urban surveillance and search and rescue work, the Jetpack?s hourly operating cost will be around 90% lower. The Jetpacks small profile means it can access, and land in, places a helicopter could never reach. The Jetpack can be flown manned, or unmanned as a carrying platform.